Colorado-well known for being a major coal producer-is shaking the coal dust off and emerging as one of the leading states in alternative energy in the western U.S., with the recent completion of the $480 million, 300 MW Cedar Creek Wind Project. In terms of energy, the State of Colorado is often thought of as being a major coal producer, rather than an alternative energy producer. But it is now on its way to becoming one of the leaders in alternative energy in the western United States. The latest evidence of this comes with the recent completion of the $480 million Cedar Creek Wind Project, which, with its 274 turbines generating 300 MW, represents one of the largest single wind-power facilities in the U.S. The project is a joint venture between Babcock & Brown Renewable Holdings and BP Alternative Energy. Babcock & Brown, fast emerging as a major player in alternative energy, started out as a financial advisor to the company that began the Cedar Creek project, Greenlight Energy. Greenlight Energy was subsequently purchased by BP Alternative Energy, which has its own aggressive plans to move ahead in alternative energy in the United States. "This is BP's first major wind power project in the U.S.," noted Bob Malone, chairman and president of BP America at the official opening of Cedar Creek. And there will be more to come, he added. "Wind power is one of America's most abundant natural resources and we believe that wind energy development is a pivotal component to the nation's drive to increase the use of alternative energy and reduce carbon emissions." The joint development approach between Babcock & Brown and Greenlight/BP Alternative Energy worked out well on the Cedar Creek project, reports David Giordano, director of wind project development and financing for Babcock & Brown. "We worked out a joint development agreement specifically for Cedar Creek where we split up the responsibilities," says Giordano. "Greenlight provided a lot of the on-the-ground development manpower and Babcock & Brown provided the structuring for financing the construction and financing the long-term ownership of the project." Babcock & Brown is the operating partner on Cedar Creek. Giordano said the company was attracted to the Cedar Creek project for several reasons. "Generally, our approach is focused on the strong basic fundamentals of a project-essentially, we are looking for an advantaged wind site. Is a site at the low, middle or high end? We like to have projects more towards the middle and high end of the curve in terms of potential productivity from the wind resource." In terms of a wind resource, Cedar Creek is in the area of a 7.5 to 8.5-on a scale of one to 10-for this region of the U.S., says Giordano. "That's region specific," he adds. "With a Colorado wind site, you're going to have a different wind scale than Texas or Pennsylvania." That it rates well is no surprise, since Colorado is said to be the 11th windiest state in the country. With Cedar Creek being in Colorado-with its regulated power markets-they were also looking for a strong off-take power agreement. This came with Public Service of Colorado, a subsidiary of Xcel energy. Part of the package, too, Giordano says, has to be reliable transmission infrastructure and reasonable interconnect costs. "Those are both important fundamentals." As is community buy-in. "It's very important to us that the project fits in with the community. We're not trying to force wind projects into areas where it would be a hugely inconsistent use of the land. "In the case of Cedar Creek, it's in an area where there is some farming, a lot of cattle and some oil and gas. Utilization of the land for wind power is consistent with how the land has been used historically, and the landowners have been receptive." Also important is having the backing of the state government, and that was there from the start. That kind of support and co-operation is a significant consideration to Babcock & Brown, says Giordano, when deciding to move ahead with a wind project. That said, he adds that there will almost always be issues to deal with on any wind project, and Cedar Creek was no exception. "We worked closely with the Colorado Division of Wildlife to manage and be sensitive to the wildlife issues in the area. But what you want to do is start from a platform of people wanting the project to succeed and figuring out ways that the project can co-exist with the environment." Key to any wind project these days is equipment, and Babcock & Brown was able to offer equipment access, in the form of the 274 turbines. There are 221 Mitsubishi models with a hub height of 226 feet and a rotor diameter of 202 feet, and 53 General Electric models with a hub height of about 262 feet and a rotor diameter of 253 feet. "For the past several years, we've held pretty substantial turbine positions with various manufacturers, so once Cedar Creek was ready to go into construction, we had the turbines to assign to the project." In most ways, construction of Cedar Creek was straightforward. Babcock & Brown had already done its homework on the geology as part of the due diligence on the project, so there were no surprises there. And in terms of weather conditions during construction, the company was told repeatedly that this area of Colorado receives very little snow. The Cedar Creek Wind Project, with its 274 turbines generating 300 MW, represents one of the largest single wind-power facilities in the U.S. The project is a joint venture between Babcock & Brown Renewable Holdings and BP Alternative Energy. But the company and contractor, M. A. Mortenson Construction, have plenty of photos showing six feet of snow at the construction site-proving that there can always be an exception when it comes to weather. "We started construction in December and got hit with some pretty serious snowstorms in January and February," notes Giordano. "To their credit, Mortenson on the wind farm side and Great Southwestern Construction, Inc. on the transmission line side were able to make up any lost days and keep us on schedule. "It always pays to keep a reasonable contingency in terms of the timeframe on projects," adds Giordano, "because it does not matter what you think or how you plan-things can turn out very differently once you start work." Equipment and supplies have to be lined up well in advance of the start of the work on any wind project these days, says Giordano. "One of the biggest limitations on growth in wind power now is with suppliers. Turbines are the most obvious, but there are other components. At the time we moved ahead with Cedar Creek, transformers weren't as scarce as they are today-but they have become more scarce over the last six to 12 months." There was a fair amount of roadbuilding that went into Cedar Creek, perhaps more so than you would have with farm land that is more crop oriented. Cropland in the Midwest, for example, would already have more of an existing road network. Plain and simple, Cedar Creek was a big project, says Giordano. "There's going to be a lot of roads associated with a project like this. We wanted to locate the turbines where they will be the most productive, and take advantage of the big space we have to avoid wake effects and wind interference among the turbines." They have one heck of a large amount of land to work with-32,000 acres to be exact. 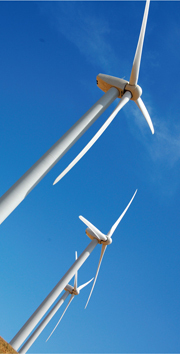 The exact siting of the turbines evolved during the planning process. Early on, they did a great deal of environmental studies on the Cedar Creek site and re-sited some turbines once they learned more about the local wildlife, to avoid bird nesting areas. "We also avoided the very edge of the mesa because that is where raptors go to nest and hunt. It's the most productive spot on the mesa for wind, but it's also largely viewed as the most threatening to raptors, so we moved turbines away from the edge to be sensitive to that." Given its size, there were plenty of economies of scale with Cedar Creek. That was certainly beneficial, says Giordano. "The right project size really depends on the market, though," he adds. "There are still going to be plenty of 80 to 160 MW projects done just because there are different markets out there. "In some ways, it takes as much effort to do an 80 MW project as it does a 300 MW project. It would be great if you could say that you were going to do just 300 MW projects going forward but that is not realistic in most markets. "Because of the distance we had to travel to make the interconnection for Cedar Creek, a large project was ideal. It would have been difficult spreading the capital costs of the transmission line over a smaller project." The location and capabilities of existing grid systems is becoming more and more of a challenge to the industry, says Giordano. "That is one of the biggest issues. In a lot of areas of the U.S. where you have the wind resource, the transmission grid is not all that robust, so that can be a limiting factor." That said, the wind industry is growing as fast as it possibly can, says Giordano, and is logically focusing on projects which have the best chance of success. "You have a bank of potential projects and some of them fall away for various development issues or get delayed. But it comes down to selecting the best group of projects each year and allocating the equipment that you have to those projects. The goal is to have a healthy enough pipeline of projects to accommodate the equipment you have ordered, and also be able to make changes should issues arise on a specific project." 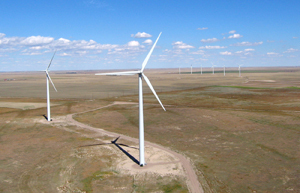 Financing for the construction of Cedar Creek was secured well in advance, which illustrates the international interest in financing wind power in the U.S. The international law firm of Milbank, Tweed, Hadley & McCloy LLP represented the multinational lenders: Mizuho Corporate Bank, Ltd., Bayerische Landesbank and HSH Nordbank AG. Though there may be some power system infrastructure limitations emerging, things seem to remain bright for the U.S. wind industry going forward. But Giordano says the industry has to work hard to make sure it continues to justify the financial support as it moves down the list of potential projects. "It's going to be difficult to make the economics work on some projects and like any industry, we need to stay responsible. Projects that go bad can hurt everyone's ability to access capital. We need to work to make sure both existing and future projects perform up to expectations and that new assets are financed responsibly so wind continues to be an attractive investment opportunity for the capital markets." That will always be important, and they don't want to lose sight of that, he says. "Even though there are going to be more wind farms across the country, and people are getting used to seeing them, for the community you are looking to build a new wind farm in, it's still going to be their first wind project-and they need to be comfortable with it."